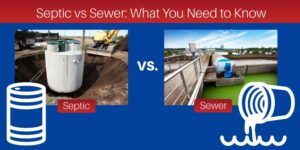 Septic vs. Sewer. What is the Difference? I get this question quite often when clients are moving from residential properties to properties with acreage. In an urban area, most homes are connected to city water and sewer. All used water from the home goes to a water treatment plant. This is where solids are separated from liquids. Solid material is disposed and liquids go through numerous disinfecting and purification processes before it returns to the general public. So, in a sense you are drinking toilet water. This treated water is actually cleaner than bottled drinking water. Residents pay a water bill for the service. In rural areas where city water and sewer are not available, homes will commonly have a septic system. The word “septic” means the anaerobic bacterial process that occurs in the septic tank which decomposes and mineralizes the waste coming from the home. The septic system composes of two main parts. The septic holding tank and the leach field. The septic tank is made up of one or more chambered concrete, fiberglass or plastic tanks holding between 1,000 to 2,000 gallons of wastewater. It is buried under the ground close to the home. A wastewater pipe from the home flows into the septic tank where solid waste settles to the bottom and scum floats to the surface. The solid waste that settles on the bottom gets digested by microbes. The non-solid liquid flows into the second chamber to filter more floating solids (scum). The remaining liquid now fairly clear, drains out to the leach field or septic drain field. Any remaining impurities are filtered into the soil and excess water percolates into the soil to be used by any trees or plants, through evaporation and in to ground or surface water. Before a septic system can be installed, a percolation test must be done by a professional septic installer to insure the soil can support a leach field. Underground, but not forgotten. A properly designed and normally operating septic system is odor-free and, besides periodic inspection and emptying of the septic tank, should last for decades with minimal maintenance. A septic tank is emptied every 2-3 years (depending on household size) and tested. Harsh chemicals or paint should never enter your septic system. This can cause the liner of your holding tank to fail. Septic safe cleaning supplies are readily available. If the septic tank gets too full, it will flood your leach field and that is stinky business! Building or driving on a leach field should be avoided. A well designed and maintained tank should last about 50 years. With a septic system, you do not have to pay a water and sewer bill. If you already have a septic system installed when you buy a new home, the cost to empty and test the tank is around $300 every three years. Possibly less expensive in other areas. If your system fails, a new tank runs about $3,000. If your tank ruptures or leaks, solid waste will enter the leach field and pollute the soil. An environmental engineer will need to come test the soil and you may pay a hefty fine. A new system to be dug will costs thousands. So, if you are thinking about building a new home on acreage land, you may want to consider the costs involved.